One of TMM’s strongest members is James Jaeger of Matrix Entertainment. James is a masterful documentary film maker who focuses on Constitutional subjects, with emphasis on Dr. Edwin Vieira, Jr.’s, writings on the Second Amendment. See Dr. Vieira’s landing page at TMM for a complete listing of his books. Both James Jaeger and Dr. Vieira were among the very first operatives to be featured in our Allied Camps section at The Mental Militia. See James’ landing page for a listing of his films, excepting his recently completed “MAINSTREAM”, a film about corruption in the New York media and in Hollywood. But Dr. Vieira also has a wonderful little book devoted to the first 13 words of the Second Amendment. 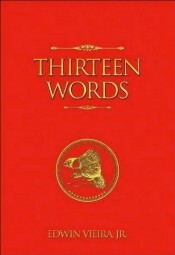 The book is titled: “Thirteen Words”. Get your copy at Amazon. Allow me to pause here and echo the seriousness of Dr. Vieira’s work on the Second Amendment. We either have a Constitution, or we don’t. Despite the fact that most Federal folks in WDC constantly act as if we do not have a Constitution, it is my opinion that the document which created those public servants’ offices is their only basis for posing as “government” employees, elected officials, and appointed public servants. Based on the fact that not one of the idiots in Congress would have a seat in government if government had not first been created by We The People, and based on the fact that We The People created that government by writing it into existence with the Constitution, it is absurd to suppose that we do not have a Constitution. That is part of our Constitution, and that particular part of our Constitution is totally ignored by those folks who are running our government. Even the good souls over at the National Rifle Association, who propose to believe in our Constitution, fail to live up to those thirteen words which open the Second Amendment. That is what James Jaeger is about to expose and heal with his new film, Good Guys With Guns. James has already issued his first progress report, so I will now place that report below for your enjoyable reading experience as you learn what James and Dr. Vieira are up to. Every time there’s another mass-shooting at a church, school or public place, predictably the same “gun-control” freaks come out and advocate yet more infringements of the Second Amendment. More gun-free zones, more registration, more limits on weapons and accouterments that could save lives. GOOD GUYS WITH GUNS explores the reasons the Founding Fathers gave WE THE PEOPLE a means of protecting ourselves, not only through the “individual right to keep and bear,” but through well-regulated state Militias. Given the first 13 words of the Second Amendment — as well as three additional clauses in the U.S. Constitution — shouldn’t gun associations, like the NRA, be supporting ALL of the reasons the Framers wanted Americans to keep and bear? Although the artwork (by Gary Varvel) may be temporary, we have a really exciting wish list of experts we are going to invite into the movie. It goes without saying we are going to invite STEWART RHODES because OATH KEEPERS will be working with MATRIX ENTERTAINMENT on this project. We are also going to invite STEPHEN WILLEFORD, the actual “good guy” that stepped in to save the day on the recent Baptist Church shooting in Texas were 26 were murdered by a madman with a gun. Accordingly, GOOD GUYS WITH GUNS, will hammer on the point that “gun-free zones” advocated by the Left’s gun-control lobby are really mass-murder zones. Given this, shouldn’t “good guys with guns” be peppered across the nation anywhere and everywhere? And shouldn’t these “good guys with guns” be trained, organized and well-regulated like it says in the first 13 words of the Second Amendment? 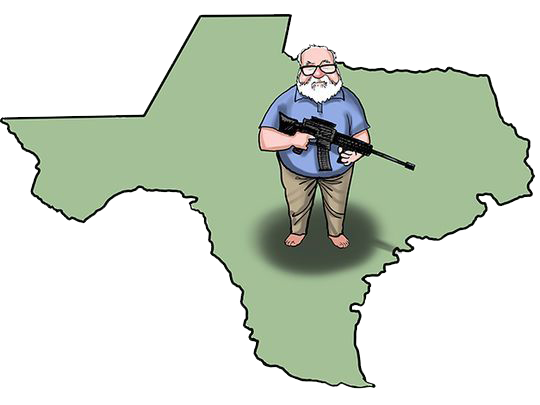 Stephen Willeford may not have been able to neutralize the Texas shooter were he not trained by the NRA in how to handle a weapon. So, in this case, we want to applaud the NRA for their part in training a “good guy with a gun” and respectfully suggest they do more of it. But as you can see from the subtitle of the movie, we are also going to ask the NRA the question: should the NRA support a Constitutional Militia? And of course the answer is yes, they should support a Constitutional Militia –– so why don’t they seem to? We will invite WAYNE LAPIERE, CHRIS COX and TED NUGENT into the film to answer this question. GOOD GUYS WITH GUNS will take a close look at the NRA Leadership and Membership and offer them some constructive criticism, hopefully to step up support of a Constitutional Militia System hence better apply principles in the U.S. Constitution. Read the first draft of the narration script at www.good-guys.us to get the details. This script is inspired by the works of Edwin Vieira,Jr. as well as a letter he sent to the NRA Board. For those of you who may not be familiar with Dr. Vieira, he holds four degrees from Harvard and is one of the foremost Constitutional attorneys in the nation. His many books include The Sword and Sovereignty, By Tyranny Out Of Necessity and Thirteen Words – all available at Amazon.com. Early donations will be prominently acknowledged in the trailer as well as the actual title sequences of the motion picture when done. This documentary will be relatively short – about 90 minutes long – and we hope to get it done by next Fall. Time is of the essence. The mass-shootings that have been happening across the nation must be addressed. The producers and sponsors of this film believe the only way they can be stopped is by “good guys with guns.” This means WE THE PEOPLE need to revitalize the Militia of the Several States and encourage our gun organizations to step up training in the proper handling of arms appropriate to stave off attacks, whether such be mass-murders, terrorist raids or the “invasions” and “insurrections” mentioned in Article I, Section 8, Clause 15 of the U.S. Constitution. Again, thank you for helping make these important films. A “free state” and “a more perfect union” are made possible by men and women who care. P.S. Go to www.good-guys.us/donate and donate whatever you can afford even if it’s only $100, $50 or $25. You can donate any amount by credit card, check or mail, once or over multiple occasions. We will keep track and automatically upgrade your Production Associate, Associate Producer, Executive Producer or Producer screencredit accordingly. Details at the donation URL. Thank you.